State of the Art Digitally Printed Clothing.T-Shirt Will Not Fade, Crack or Peel After Multiple Washes.Officially Licensed Apparel. Printed in the U.S.A.100% Soft Cotton, Feels Great!Custom Made to Order. Takes 2-5 Business Days to Make to Perfection. State of the Art Digitally Printed Clothing..
T-Shirt Will Not Fade, Crack or Peel After Multiple Washes..
Officially Licensed Apparel. Printed in the U.S.A..
100% Soft Cotton, Feels Great!. 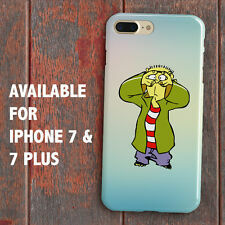 Printed on 100% Soft Cotton Material. 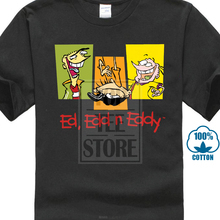 ED EDD N EDDY Short Sleeve casual tee shirt with graphic printed ITS AN ED THING designQuality fashion apparel, perfect tshirt for every day, gym workout, or pajama shirt100% Cotton machine washable great Birthday, Christmas, special gift for a ED EDD N EDDY fanGreat gift for boy, girl, son, daughter, nephew or nieceOfficially licensed clothing, graphic is expertly printed directly on the front of the garmentEXPRESS BEYOND with this ED EDD N EDDY tee shirt. A casual shirt with its irresistible graphic printed ITS AN ED THING design, this shirt is great for every day, at the gym for a workout, or as a comfy pajama. These short sleeve tees make a perfect gift for a boy, son, brother, grandson, nephew, girl, daughter, sister, granddaughter, niece or best friend and will be remembered for a long time.HIGH QUALITY that will last for years to come. This fashion apparel is made with 100% cotton quality fabric that will last through many washes and features a comfortable fit. Machine wash separately in cold water. Do not bleach. Tumble dry or lay flat.GREAT GIFT: Makes a great quality Birthday, Christmas, or special gift for your fan.OFFICIALLY LICENSED clothing. The graphic is expertly printed on the front of the garment.100% SATISFACTION GUARANTEE: We are always listening, that's how we are able to bring you the best quality. We care. 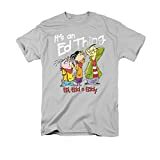 ED EDD N EDDY Short Sleeve casual tee shirt with graphic printed ITS AN ED THING designQuality fashion apparel, perfect tshirt for every day, gym workout, or pajama shirt100% Cotton machine washable great Birthday, Christmas, special gift for a ED EDD N EDDY fanGreat gift for husband, boyfriend, son, grandson, wife, mother, girlfriend, daughter, granddaughterOfficially licensed clothing, graphic is expertly printed directly on the front of the garmentEXPRESS BEYOND with this ED EDD N EDDY tee shirt. A casual shirt with its irresistible graphic printed ITS AN ED THING design, this shirt is great for every day, at the gym for a workout, or as a comfy pajama. These short sleeve tees make a perfect gift for a man (husband, boyfriend, son, grandson, uncle, nephew) or a woman ( wife, mother, girlfriend, daughter, granddaughter, aunt, niece ) and will be remembered for a long time.HIGH QUALITY that will last for years to come. This fashion apparel is made with 100% cotton quality fabric that will last through many washes and features a comfortable fit. Machine wash separately in cold water. Do not bleach. Tumble dry or lay flat.GREAT GIFT: Makes a great quality Birthday, Christmas, or special gift for your fan.OFFICIALLY LICENSED clothing. The graphic is expertly printed on the front of the garment.100% SATISFACTION GUARANTEE: We are always listening, that's how we are able to bring you the best quality. We care. The design depicted is only printed on the front of the t-shirt. There is no design on the back of the t-shirt.This t-shirt is hand-made and unique, using a high quality cotton/polyester blend for that naturally soft feel. This graphic print design is printed only on the front of the shirt.Image is for clarity. Due to different computer monitors/calibrations, colors may vary from the picture. 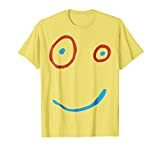 ED EDD N EDDY Short Sleeve casual tee shirt with graphic printed TEAM EDDY designQuality fashion apparel, perfect tshirt for every day, gym workout, or pajama shirt100% Cotton machine washable great Birthday, Christmas, special gift for a ED EDD N EDDY fanGreat gift for boy, girl, son, daughter, nephew or nieceOfficially licensed clothing, graphic is expertly printed directly on the front of the garmentEXPRESS BEYOND with this ED EDD N EDDY tee shirt. A casual shirt with its irresistible graphic printed TEAM EDDY design, this shirt is great for every day, at the gym for a workout, or as a comfy pajama. These short sleeve tees make a perfect gift for a boy, son, brother, grandson, nephew, girl, daughter, sister, granddaughter, niece or best friend and will be remembered for a long time.HIGH QUALITY that will last for years to come. This fashion apparel is made with 100% cotton quality fabric that will last through many washes and features a comfortable fit. Machine wash separately in cold water. Do not bleach. Tumble dry or lay flat.GREAT GIFT: Makes a great quality Birthday, Christmas, or special gift for your fan.OFFICIALLY LICENSED clothing. The graphic is expertly printed on the front of the garment.100% SATISFACTION GUARANTEE: We are always listening, that's how we are able to bring you the best quality. We care. Officially Licensed Cartoon Network T-Shirt.